What are the top 3 funniest brand Twitter accounts? 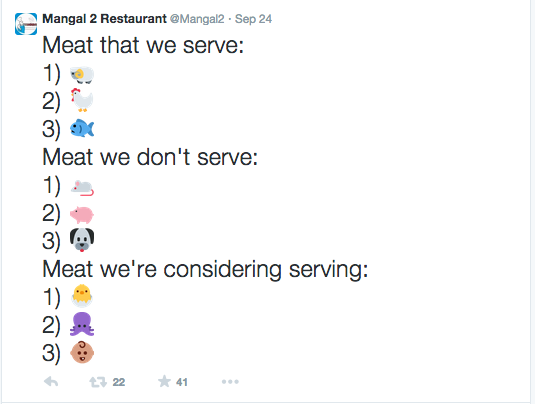 Brand Twitter accounts don’t need to be boring, here’s some of the funniest accounts out there. 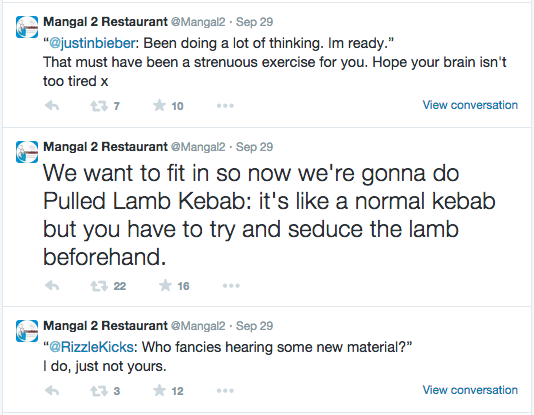 Mangal 2 is a Turkish restaurant with one of the most original and amusing brand voices on social media. While not for everyone – and especially not the sort of brand tone of voice that say, a financial advisor (or nando’s) could adopt, it clearly works. If you could name another small restaurant with over 14 thousand followers, we’d like to see it. Old Spice have revolutionised their brand with a bold new rebrand in the past few years, and it’s Twitter account has changed tact too. 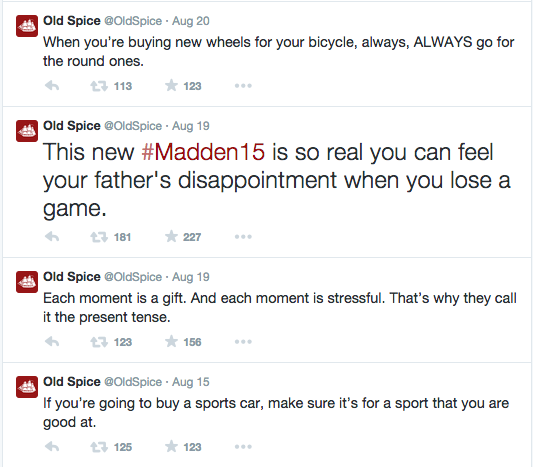 Instead of overwhelming followers, Old Spice keep things light and brief. Self-promotion is sparse, and even tweets in general; the account averages just 1-3 tweets a day. This quality rather than quantity approach can often work well, as if your audience is drip fed funny Tweets, they are much less likely to unfollow. This is evident in the massive 224K followers Old Spice has managed to accumulate. Tesco nail the moderation needed between promoting their offers and campaigns with humour, as most of its output is intended to entertain, rather than sell. 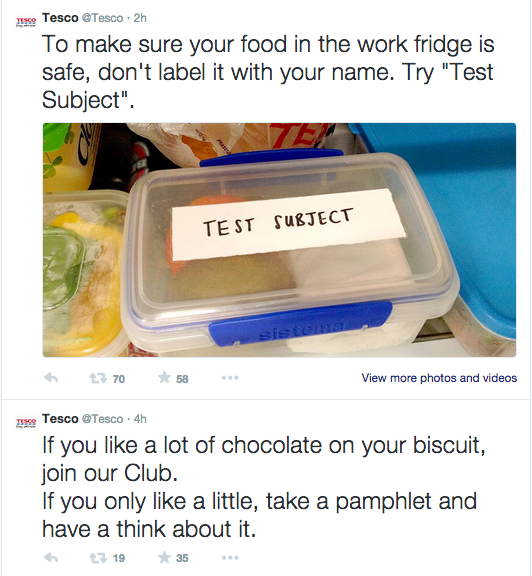 Tesco uses it’s account as a Customer Relationship Management (CRM) tool – responding to complaints and questions, while simultaneously providing frivolous, light-hearted content. This approach helps humanise Tesco – who have been bold enough to try something original, especially compared to some of it’s supermarket competitors. Would you want someone to stand on your doorstep trying to sell you things? Of course not. Twitter is a platform that makes it easy to project your voice – often a little too easy. Self-promotion makes people switch off and will have a negative effect on your social media success. Self-promotion is boring and importantly, does not convert. The role of social can be simply to keep your brand is the mind and periferal vision of potential customers, rather than ramming sales messages down their throat. When it’s appropriate, humour can be a good thing on your social media output. People like speaking to other people, not robots. Being too prim and proper with your social media output can put people off and make it less likely Twitter users will engage with your brand. Before you write or tweet anything, have a real think about what tone of voice you want your brand to have. Consider your audience (by thinking about what they are actually like), consider your services and think about how you’d like to be perceiving before tweeting any banal, self-promotional content.